Earlier this week The Good Car Guy showed five Graphs which explained with no small measure of thoroughness how greatly Volvo USA is relying on the XC60. On a similar note, the Volvo XC60 formed 31.4% of all Volvo Canada sales in November 2010. 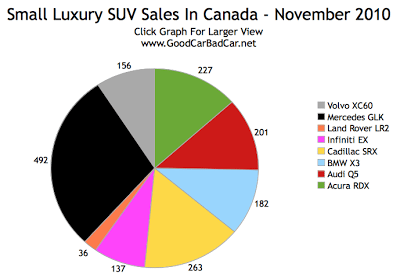 In a more normal manner, the best-selling small luxury utility vehicle, the Mercedes-Benz GLK350 4Matic, made up just 19.7% of all Mercedes-Benz Canada sales in November. 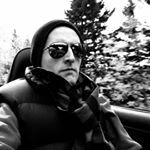 Not unlike the situation with the 2011 BMW 5-Series in the midsize luxury car category, the brand new 2011 BMW X3 will likely have enough sway to reconfigure the small luxury SUV segment in the coming months. Will the GLK stay on top, or will the X3’s seven competitors all lose sales? Among slightly larger and quite-a-bit-larger luxury SUVs, the Lexus RX had a personally difficult November but maintained its best seller status. RX sales were down 30% in November 2010. Lexus sold 71 RX450h hybrids in November 2010, ten fewer than in November 2009. (Overall, Lexus sold 149 gas-electric hybrids in November, down 3.2% from last year.) Also, the Lexus GX has joined the midsize luxury SUV Graph since it was never actually meant to spend time in the large luxury SUV sector. 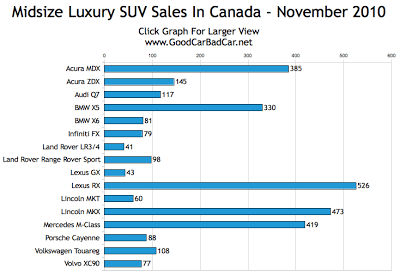 Those who love to compare Canadian and U.S. sales data will be interested in the Cadillac SRX vs. Lincoln MKX battle that may not even exist. In the USA, the Lincoln MKX starts at $39,145; the SRX starts about $5300 below the MKX. U.S. sales this year have the SRX topping the MKX by 25,558 units. 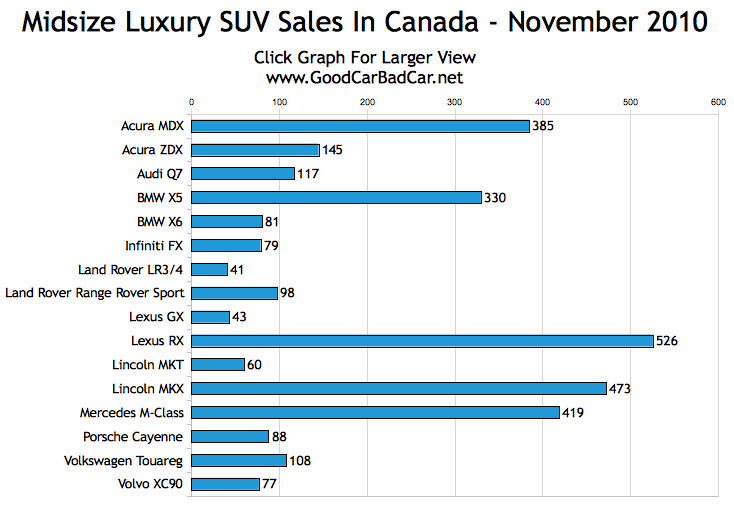 In Canada, where the 2011 Cadillac SRX is priced $4720 below the MKX, the MKX is 1.5 times more popular than the SRX. Details on exact sales figures are in the accompanying charts.